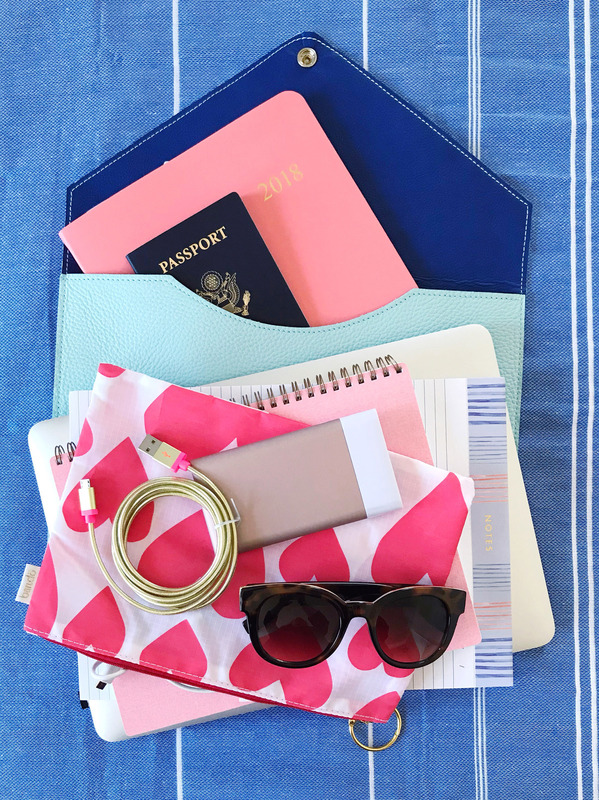 Traveling Well: Packing Tips for Getaways. I am currently suffering from a major case of wanderlust, and have been browsing flights, daydreaming of new destinations, and mentally packing my bags for a new adventure. I don’t exactly have the vacation booked yet, but once we decide on where we’re going, I’m going to be ready! 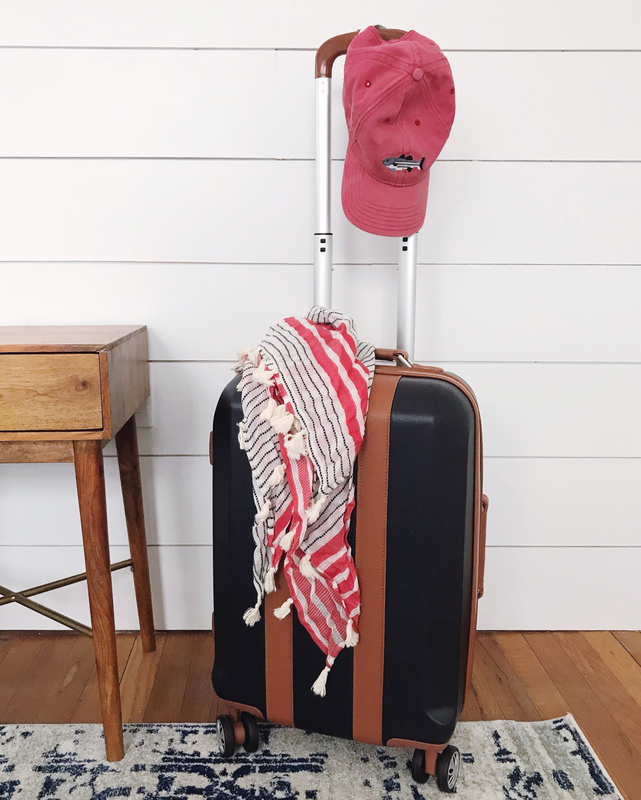 When it comes to prepping for a trip – big or small – I have developed my own system for staying organized and making packing a little bit less of a hassle. To start, I always make a massive list for our whole family. I write each day of the week we’re going to be gone for alongside one edge of the page, and then add a space at the bottom for things we’ll use every day (like toiletries, chargers). Then I write each of our names across the top of the paper and start filling in what we need for the trip. It helps me visualize what we’re actually going to use each day, so that I don’t over pack or forget anything. I always start with clothing first, since that makes up the bulk of the packing list on most trips. I recently broke the zipper on my old suitcase and decided it was time to upgrade to some new luggage that didn’t make me crazy every time we traveled. 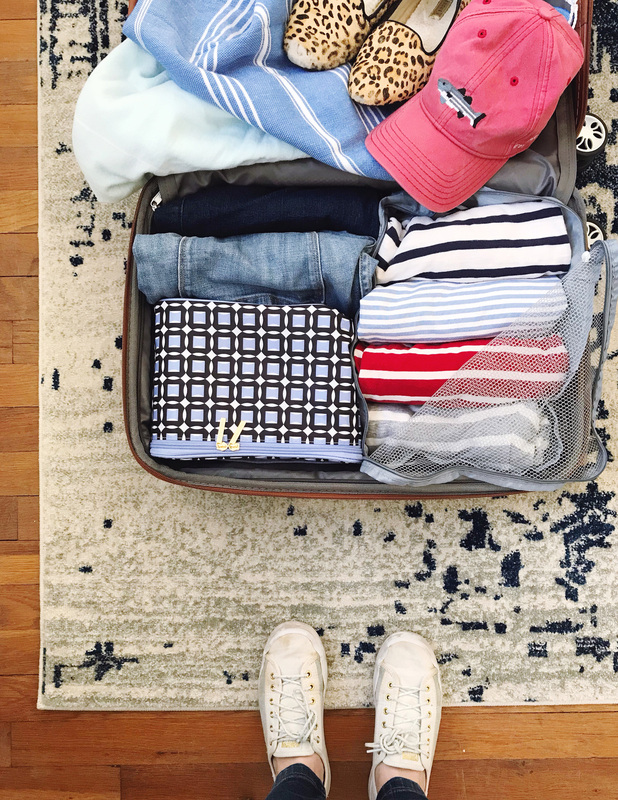 Marshalls is my go-to spot for brand name, high-quality travel items, and I found a really pretty hard-sided rolling suitcase with lux-looking leather details and divided interior compartments. I’m kicking myself for not upgrading earlier, it was such a great value at $79.99 (compared at $129.99) I also found a set of packing cubes when I was in the store, and have heard so many people talk about how great they are for keeping your suitcase organized while you travel so I grabbed a set to try out! Sometimes my husband and I will share a suitcase if we’re just going away for a weekend, so I love how they enable me to divide up the suitcase with each of our clothes. Next come accessories, which I try to keep lean when I’m traveling. I stick to a cohesive color palette so I can mix and match pieces together, and try to pre-plan which pieces will go with which outfits. I tuck them all into a small travel jewelry box, which makes it easy to find in my luggage. 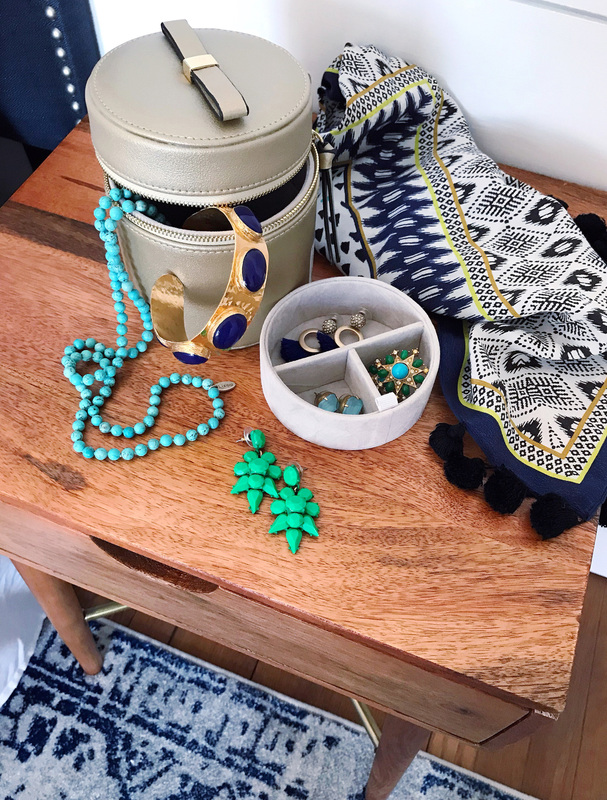 I found a small gold leather jewelry box with a pretty little bow on top at Marshalls, and love that the interior tray comes out so I can keep these pieces organized on my nightstand in hotels. I love to streamline all of the make-up and toiletries I’m packing, and divide them into individual zippered pouches. I put one together with my make-up basics, one with stuff for my hair, and the last one with toiletries like toothpaste, face wash, and my contact solution. I found a great set at Marshalls that came with all different sized zippered bags. I love this approach because then if I need to pull my make-up bag out at the airport, I’m not digging through tons of stuff. I just grab the bag I need and go! 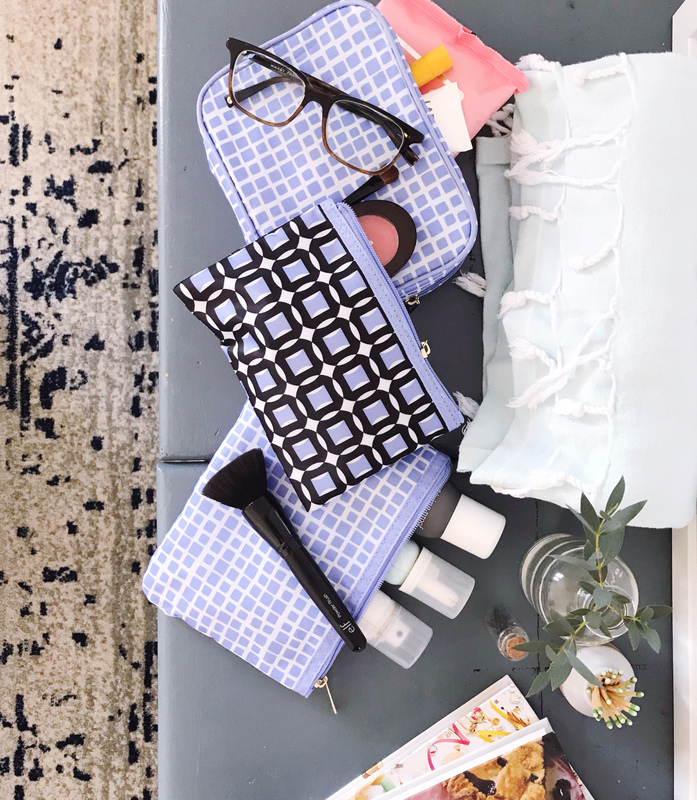 The last thing I tackle when packing is all of the stuff that will go into my tote bag, which I carry on to a plane or bring in the front seat of the car with me for road trips. Usually this means gathering magazines, my computer, chargers, and my camera. An organized bag is so necessary for me to keep my vacation-mode zen! I found a beautiful leather envelope at Marshalls that keeps magazines, my notebook, and laptop organized and upright in my tote (crumbled magazines that slide to the bottom of your bag are the worst!). Then I use a few small zippered pouches to protect my camera and organize my chargers and cords. I also always bring an external back up battery when I travel (I love finding good surprises like these at the check-out aisle at Marshalls), because I end up using my phone so much when I’m snapping pictures and looking up directions when we’re on the go. After that, all that’s left to do is zip up our bags and hit the road! Are you heading anywhere fun for winter travel? Brownies With Salted Nutella and Cream Cheese Drizzle. My Top 15 Favorite Kitchen Tools. 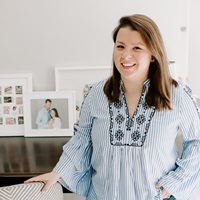 One Response to "Traveling Well: Packing Tips for Getaways." Thanks for the great tips! I needs to check out Marshall’ s.